It seems like ages since I lasted posted, and it has been. We had a bout of the cold and the flu doing the rounds at our place last week. We are just about back to normal and I simply had to publish one post before I got on with the millions of other stuff that needs my attention right now. Before I went on my vacation, I stumbled onto a very interesting way to cook eggplant over at Manuela's blog. I was a little intrigued by it and wasn't sure what the outcome would be. The picture I saw was very convincing, enough to make me give this a try. I'm so glad I did. This recipe is simple to put together. It gets a little messy while shaping the batter into patties, but the end result is so worth the effort and the mess. 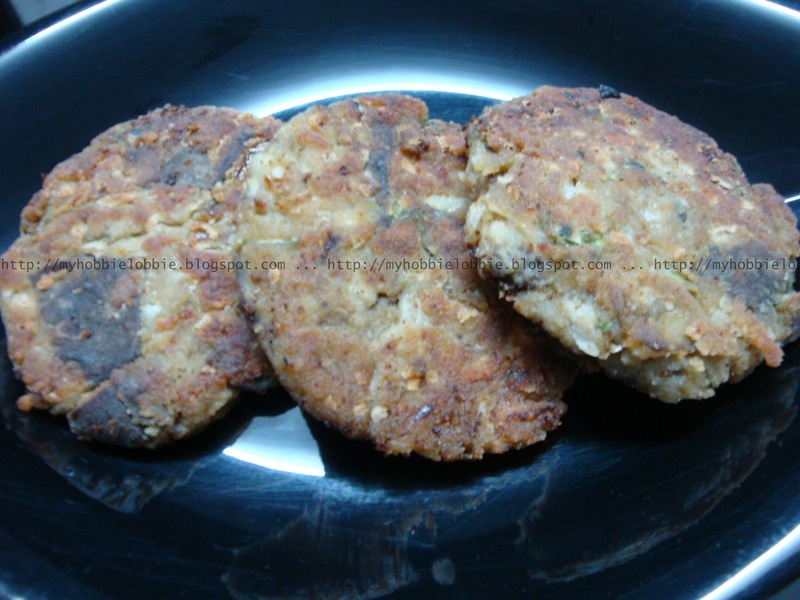 The patties had a lovely crunch to it and they tasted wonderful. They are not overly spiced, which means you get to relish the delicate flavors of the eggplant and the mild spices and they are surprisingly hearty. Serve these with some salad and bread and you've got yourself a lovely meal. Cut the stalk of the eggplant, wash and cut into 4-6 large chunks and cook in salted boiling water until just about soft. Mash it and add the breadcrumbs, egg, ginger, garlic, salt, cumin powder, chilly powder, crushed black pepper and chopped coriander leaves and mix well. You will need to adjust the quantity of bread crumbs used, based on how wet the batter is. The batter needs to be stiff enough to shape into round patties. Dampen you hands with a little water so that the batter doesn't stick to it. Shape into round patties. Dip the patties in flour to coat them. Heat some oil in a pan and shallow fry the patties till they are a lovely golden brown. My mom would love this dish! Eggplant is a treat for her. Thanks for stopping by, and Manu, if I had all the gorgeous ingredients that you'd use originally, I would have stuck to those! Thanks Reshmi, this was my first time trying such an eggplant preperation and definitely wont be my last :-) !!! Glad to hear that everyone's on the mend! We had a bout of the flu here as well. Ugh! I love eggplant, so the patties, seasoned with cumin and chili powder sound soooo good! Definitely going on my must-try recipe list! Manu it sounds like a lovely idea and I would love to be a part of it. When do you want me to send you the details?